KH moaned softly laying in her bed tossing & turning on it. It was late at night, & no doubt that L was probally still awake. For once, before she went to bed she had brushed her hair. & as she sat up it covered her back & dropped down to the bed. She wore a pure white night gown dress with afew lases on both the top & bottom of it, & dropped under her knees. She looked at the window, both hearing & seeing rain pounding up agenst it. Sighing gently she stood up, haveing her vertebre pop afew times, she walked to the window & opened it happy to feel rain drop on her body. Swinging herself out from the window, she grasped onto the small medal ladder that was attached to the building, & right next to her window. Holding onto the ladder she reached her right leg out & closed the window, leaveing a rather large puddle of water in the room afterwards. Climbing up the ladder she was glad to feel the rain agenst her skin once more; It brought back both good memorys, & bad ones. Standing up from the ladder & onto the room she looked at the two doors on the side of the building that lead inside, & hoped that they were locked from the outside. Looking up at the cloudy sky as it rained drops of rain dripped on her face & rolled down her cheeks almost like tears. The rain soon soaked both her hair & dress, but the dress was not see through, it simply just stuck to her skin. But at the moment she did not care. She just continued to stare up at the sky, holding both of her hands together on her chest & held a small smile on her chest, remembering the times that happened after Takanaka took her in as his own. "Why are you sitting out here in the rain, personlly, I hate the rain. Do you like it, or somthing?" He pulled a peach out of his torn jacket, and took a bite out of it. Still looking to the sky she turned her head towards Tomix & shook her head abit makeing her hair whip slightly before it settlyed again & most of it mopped over her eyes. "Yes, I'm fine.." she said softly before looking back to the sky. Smileing softly allowed the rain to drop on her face again, some of it pushing back her hair. "It just helps me think is all." she said in the same voice still looking to the sky. "Oh well, if you're fine." He looked back out. Even though he was a shinigami, he had hair like a human, and his visable parts of his face were human-like. His dark hair was sopping over his sapphire eye. "Never did like the rain much...always stopped me from concentrating..."
Tomix looked at the moon. "I always did like the moon..."
Still looking to the sky she turns abit to notice the moon. "Mnn. I didn't even reconize that. I never saw it comeing out..." she said softly beforelooking forward & shaeing her head again then looking to Tomix. "I can allways head back inside so the water will not bother you." she said calmly. "It looks like the rain is going to end." but even as she said this the rain continued to pelt on her & the ground. "Really? I always notice the moon, it's one thing I always like staring at. Well, that and peaches." He brushed his hair out of his eye, then it immedietly moved over it again. "Nah, it's okay. It doesn't really bother me that much." He turned to her, more seriously. "Have you used the Death Note yet?" Still looking to him she shook her head lightly. "Before I even try that I need to come up with a stratagy that will go on for awhile now; Or else I might get caught before I can use it to my fullest." Still looking at him as she finished this she looked back to the sky allowng her hair to mop over her eyes & face. "Just give it pactience. I allready have most of it planned out." "Okay...It's just been quite boring around here ever since I gave you the Death Note. Maybe I shouldn't have agreed not to kill anyone...Ah well." "What do you mean, planned out?" He was now quite intrested, in her so-called, plan. "Simple, a tatic. Ryuzaki allready thinks that I am Kira. 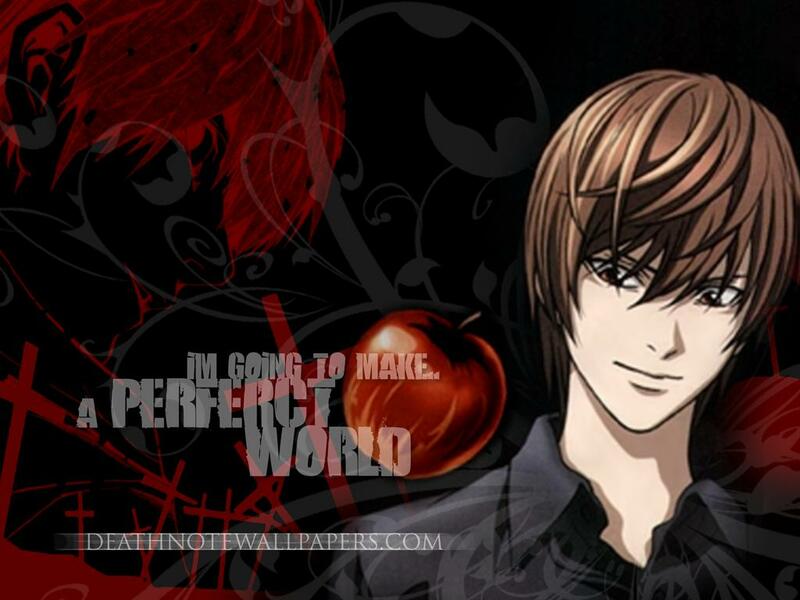 In which, I am not, but I own a DeathNote, so I may just want to acy like myself without it, & not go crazy with power.. Becides, I wanted to know if you can explain things to me about these rules." still looking to the sky her eyes turned towards him to see if he was going to do anything. 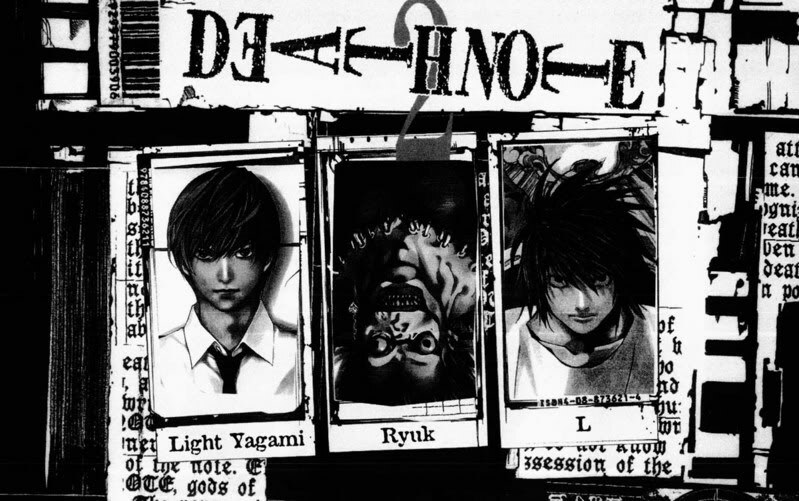 "You want to know the rules about the Death Note? That would take quite a while...I could teach youu the basic rules, but remember, I don't know everything about the Note myself...I guess you know the basic stuff, the Human who's name is written into this Note will die, and all that, I presume?" That was quite a mouthful, so he waited for her reply. Turning her head slightly to look at him she nodded her head softly before she froze suddenly hearing a window open. Looking around she saw a rather large antennah & soon quietly ran to it. Jumping up & grasping the top of it she hung over the side of the building from the attaneh which was acting like a spring. "Hana?" a male's voice came from the top of the roof. Looking down & studying the side of the building she spotted a flag pole.At this time Takanaka noticed the attenah being pulled on & walked to it. Comeing up with an idea she let go of the attenah which soon smacked into his face. Skidding her hands down the side of the building she fell onto the flag pole keeping her legs folded over it. "Sorry!" she shouted back at him before she held onto a window that was nearby, opening it slighlty then hanging from it before she opened it more & hopped inside. "I had better lost some weight with that workout." she said flatly beging to walk from the bathroom that she landed in. Tomix eyes widened at the complex seires of manuvers to make it into the other bathroom window. When he at last caught up to her, he was panting slightly. "Um...what was the total point of that? I mean, why did you just sorta jump over here?" "Looking to him with her hair still mopped over her face she smiled before haveing to answer, "Well, It's simply-" but then got cut off by Takanaka's yells. "HANA!" he yelled comeing up behind her & gripping the back of her neck to where she could not move. "It's one thing being up there, but I don't want to see you dead on the side of the building like a frog!" he snapped still holding her. His face was red with anger & a mark was on his face from the attenah. "Him." she muttered slatly to Tomix before Takanaka let go of her neck & grabbed her ear pulling her to her room. Tomix was laughing his head off, hovering behind Hana and Takanaka as she was dragged away. "Now, I honselty have never imagined you as the person getting dragged around by some guy? HAHAHAHAHA!" His blue eye was flying open and shut over and over again. "...Do you believe she could be Kira?" The electronic voice poured through the screen, a glowing 'N' on the screen, despite the presence of two people behind the other screen only one voice flowed through. "Yes, it is very possible that she could get hold of Kira's killing tool. It will corrupt her eventually whether she knows it will or even if she denies it. She will kill me eventually. Be prepared." He replied, flicking a sugar cube across the table. "Near, Mello. I ask you to be prepared for that day, nothing more. Learn to work together and you will both surpass me with ease." "No we won't." The voice whispered, although electronically altered the element of fear still within it. "Of course you will. I believe in you both." Flicking the switch, the connection died in an instant, all memories of the conversation deleted. Takanaka placed her on her bed & she soon sat on it looking up to him. "Now get dressed in something dry, I don't want you to get sick." he said softly before walking to the window to make sure it was shut, then walking from the room. "He's the closest thing to a father I have, hard to belive." she muttered softly acting as she was talking to herself. She knew that L had allready bugged her room, which is why she only murmered this. Sighing gently she walked to a small closet & pulled out another white nightgown & soon walked to the bathroom quickly un-dressing from the wet one & into the dry one, decideing to ignore her wet moppy hair. Afterwards she shuffled towards her bed, before she sat on it & looked to the ground trying to think ahead in time. There's no way he could find, it, either if he thought I was Kira.. I knocked out the cameras long enough so that he could not see nor hear where I hid it... she thought to herself continueing to sit with her arms on her legs & stareing to the ground through her hair. Tomix followed Hana and Takanaka back into her room. "Yes, Yes, Hana, you should do as your told." Tomix cackled with laughter after this. He listened when she said he was like a father. "Well...Be lucky you have someone like that. Shinigami don't have anything like that. In fact...we don't even know what created us..."
Tomix did NOT follow her into the bathroom. He may be a Shinigami, but he was a smart one, and he DID have some respect. Leaning closer to the screen, he watched KH in her room. It was no secret that he had bugged the room, but that did not explain why she was talking to nothing. She was trying hard to keep her lips still, but the movement still showed and Takanaka in the next room paid no attention to it, she obviously wasn't speaking to him. Why would she say that Takanaka is like her father when she can say that in her head? No...there is something in that room with her. A shinigami perhaps? He pressed a thumb to his lip as he thought. Leaving the camera running, he began to flick through the old material, looking for gaps in the timings. She continued to sit there with her arms on both knees & stareing to the ground wondering. Sighing gently she shook her head softly holding the side of her head with a slight headache. Pulling her legs up on the bed she decided not to let many things happen between Tomix & her such as talking. Not really careing much for the light, she did her best to ignore it while she continued to think hopeing to find a solution. "I guess you've known for a while that Ryuzaki has been bugging you're room, and putting cameras in. I wonder if it's more then just for wondering if you're Kira or not." Tomix grinned, wondering if Hana would get hint. Picking up the remote, he paused the reruns which he was watching on several other screens. Pressing the play button, he resumed watching it, the video itself seemed to be on automatic re loop. Sighing gently still laying in her bed she soon sat up in it after hearing Tomix's statement & then stood up, popping her backbone & legs afew times as she did. Walking once again to the window, she soon opened it & curled around the side of the window & onto the ladder again before she closed the window with her toes & began climbing up the ladder. She soon sat at the corner of the building looking out to the dark city & allowing the water to pound on her again as she waited for Tomix. "Man...why does she like the rain so much..."
He followed Hana outside again. "Y'know, he is most likely checking the tapes because, he most likely knows you knocked out the tapes so you could hide the Note." He wondered how she would counter that. This Ryuzaki sounded smart...smarter then himself. He would most likely find the Note. Hopping from his chair he padded from his room, taking care to seal the room after he left. Kurai was on the roof, this much he knew. He also knew that the rain would last for approximately thirty seven minutes, all of which she was more than likely to stay up there. Walking into her room, he put his hand into the deep pockets of his baggy blue jeans. Pulling out a small piece of electronic equipment, he slid it into the bookshelf, covering the whole of the camera except the lens. He walked back out of the room, shutting the door once more. Hana looked to Tomix for a second after he came up & joined her & smiled saying softly, "I never had to, 'knock out' any of the tapes. I simply hid it somewhere where no one, not even L would think of it to be." she snickered softly before looking back to the sky wondering. "I just need to figure out what to do whith it, & how exactly to use it..." Hana's head popped up slightly when she heard & felt the sound of her door closeing. Sighing gently, trying to ignore it, she looked back up to the sky. Tomix knew what Ryuzaki was doing. Most likely making one of those cameras less conspicious. He decided to mess with Hana a bit more. "You know that was Ryuzaki right? He didn't knock...What if he walked in at an arkward moment?" He cackled with laughter at the thought. L pressed his thumb to his lip as he crept down the empty hallways. More annoyed at the loss of a notebook then his face allowed himself to show, he bit his thumb. Tooth prints embedding themselves in the delicate flesh. "It will make itself known sooner or later.." He muttered to himself, words muffled by the thumb filling his mouth. "It's simple," she began. "What is cold & does not have a heart? What is also hard & nothing can soften it? What can be kept still be cold & shrunk by cold as it is expanding in the heat?" she snickered softly pulling her legs from the side of the building & laying to her side hugging her legs to her chest. "That, is where I hid it." she said softly knowing that Tomix would not know what she was talking about. "Well...uh...OKAY I don't know what it is...You have a creative mind...geez, you're smarter then me, and I'm one of the smarter Shinigami." He moaned at his idioticy. He'd been able to solve any puzzle back home, if the others saw him here they'd laugh thier heads off. He walked along the corridors. Stopping at the kitchen several times, pulling various calorie filled treats out and demolishing them in minutes. "Yum." He murmured, wiping a fleck of cream from his face before padding back to his room to review the tapes once more.